Brevipalpus phoenicis (Geijskes) is a tropical-subtropical species that has been accidentally transported by people to many areas of North America. It survives under greenhouse conditions beyond its natural range. This mite has an extensive host range and may cause economic damage, depending on the host. Mites in the family Tenuipalpidae are called false spider mites (because they do not spin a web) or flat mites. Brevipalpus phoenicis is the most common false spider mite. Figure 1. Adult female false spider mite, Brevipalpus phoenicis (Geijskes). Photograph by United States Department of Agriculture. Tenuipalpus phoenicis Geijskes, 1939: 23. This species was described by Geijskes from specimens collected in a greenhouse in Haag, Holland. Female from Haag, Holland, on Phoenix sp., in the Laboratorium von Entomologie, Landbouwhoogeschool, Wageningen, Netherlands. Brevipalpus phoenicis has been recorded from Argentina, Australia (as passionvine mite), Brazil, Cuba, Egypt, Guyana, Hawaii, Holland, India, Jamaica, Kenya, Malaya, Mauritius, Mexico, Spain, Taiwan, and the United States. It has been recorded on the mainland of the United States from California, District of Columbia, and throughout the Florida peninsula. Adults: Adult females are about 275 µm long, including the rostrum. The body is flat, with light to dark green or reddish-orange coloration. A black mark in the shape of an H becomes visible when these mites are reared in temperatures between 68°F and 77°F (Haramoto 1969). Two pairs of legs extend forward and two pairs extend backward. The two sensory rods on tarsus II separate it from the privet mite, Brevipalpus obovatus Donn., which is often found with it on the same plant. Figure 2. Tarsus II with two sensory rods (left), Tarsus II with one sensory rod (right). The adult male is flat, reddish and more wedge-shaped than the female. Males lack black markings (Haramoto 1969). On average, adults live for a maximum of 47 days at 68°F and a minimum of 7.5 days at 86°F with a relative humidity of 85 to 90 percent (Haramoto 1969). Duration from egg emergence to adult ranges from 10.6 days at 86°F to 27.3 days at 68°F under laboratory conditions (Haramoto 1969). Prolonged periods of temperatures above 86°F and below 68°F are fatal to immature stages (Kessing and Mau 1992). Figure 3. 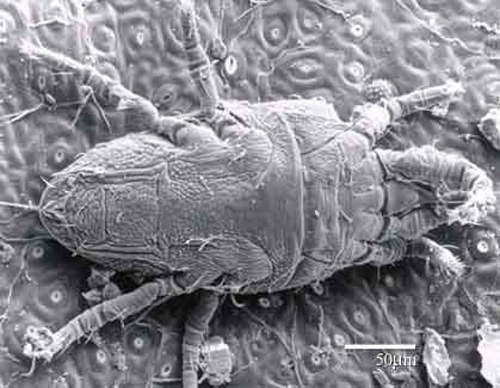 Dorsal view of a typical female false spider mite, Brevipalpus sp. Photograph by Division of Plant Industry (After Baker). Figure 4. 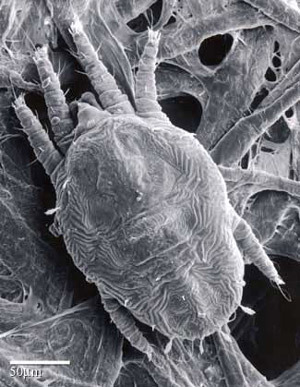 Ventral view of an adult female false spider mite, Brevipalpus phoenicis (Geijskes). Photograph by United States Department of Agriculture. Eggs: Eggs are deposited singly, but often near those from the same female, in cracks, crevices and other protected areas on the plant surface. These clusters of bright reddish-orange eggs are more easily seen with the naked eye than any other life stage. Eggs have a stipe (tail-like projection) that extends from the slightly pointed end that comes out of the female mite last. This stipe often breaks off if the egg is handled. A day before hatching, the eggs become opaque white and the red eyes of the larva are visible within (Haramoto 1969). Larvae: Larvae are six-legged and bright orange-red when newly emerged, but turn an opaque orange when fully grown (Haramoto 1969). Figure 5. 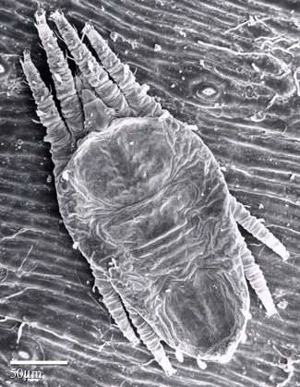 Larva of the false spider mite, Brevipalpus phoenicis (Geijskes). Photograph by United States Department of Agriculture. Nymphs: There are two nymphal stages: the protonymph and the deutonymph. The protonymph is larger than the larva and has eight legs. The outer shell is transparent, light green, orange, black and yellow patches may be seen within the body. 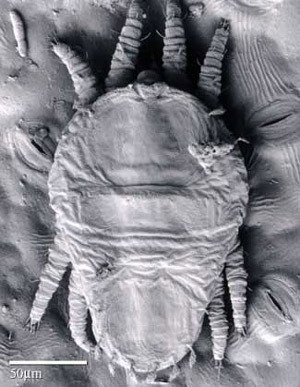 The deutonymph is similar in appearance to the protonymph except for having an extra pair of legs and two additional setae (hairs), and being slightly larger (Haramoto 1969). Figure 6. 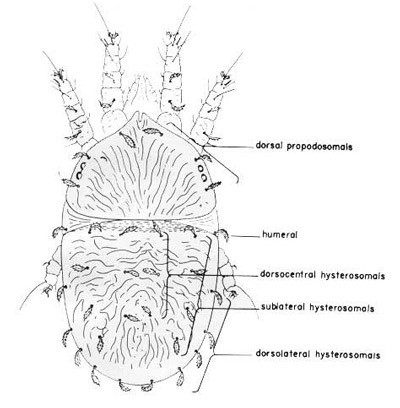 Protonymph of the false spider mite, Brevipalpus phoenicis (Geijskes). Photograph by United States Department of Agriculture. Figure 7. Deutonymph of the false spider mite, Brevipalpus phoenicis (Geijskes). Photograph by United States Department of Agriculture. 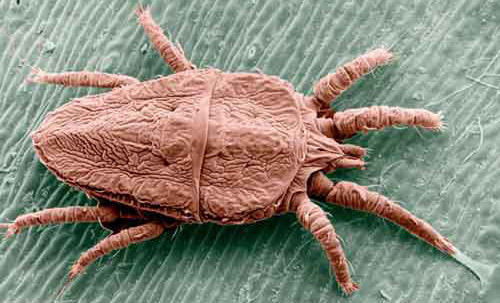 This mite species was reported as having over 65 hosts (Baker and Pritchard 1958), but United States Department of Agriculture scientists now say there may be as many as 1,000 hosts (USDA 2004). A few major hosts from Florida are: Aphelandra, gardenia, grapefruit, hibiscus, holly, ligustrum, lemon, lime, orange, pecan, and viburnum. Feeding by this mite weakens the plant and causes mesophyll collapse. Damage is visible on both sides of the leaves. Old damage is characterized by browning of the damaged area. In addition, some hosts exhibit deformed leaves. Symptoms are more prevalent in the spring, summer, and fall. Brevipalpus phoenicis transmits the Citrus leprosis virus (CiLV). Citrus leprosis causes yield reduction and eventual death of the affected trees if its mite vectors are not controlled. Citrus leprosis, while not currently a problem in the U.S., substantially damaged Florida's orange crop in the early 20th century but was eradicated in the mid-1920s. However, it is slowly progressing northward from its outbreak epicenter in South America. 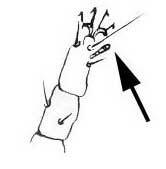 Only Brevipalpus phoenicis has been experimentally confirmed to transmit CiLV. Two closely related species, Brevipalpus californicus and Brevipalpus obovatus, also are suspected transmitters (USDA 2004). Brevipalpus phoenicis has at least four natural predators. Unfortunately, these predators generally fail to provide economic control. Predation becomes noticable only after Brevipalpus phoenicis achieves a very high population density and severe plant damage has already occurred. As a result, other management agents, such as pesticides, are necessary for economic control (Haramoto 1969). In the early 20th century, sulfur was used to control this pest in Florida, but the use of sulfur in today's management programs should be minimized given its toxic effects on beneficial arthropods (Childers et al. 2005). Childers CC, French JV, Rodrigues JC. 2003. Brevipalpus californicus, B. obovatus, B. phoenicis, and B. lewisi (Acari: Tenuipalpidae): a review of their biology, feeding injury and economic importance. Experimental & Applied Acarology 30: 5-28. Geijskes DC. 1939. Beitrage zur kenntnis der europaischen Spinnmilben (Acari: Tetranychidae) mit besonderer Beriicksichtigung der niederlandischens Arten. Meded. Landbouwhoogeschool. Wageningen. 42: 1-68. Haramoto FH. 1969. Biology and control of Brevipalpus phoenicis (Geijskes) (Acarina: Tenuipalpidae). Hawaii Agricultural Experiment Station Technical Bulletin No. 68: 1-63. Kitajima EW, Rezende JA, Rodrigues JC. 2003. Passion fruit green spot virus vectored by Brevipalpus phoenicis (Acari: Tenuipalpidae) on passion fruit in Brazil. Experimental & Applied Acarology 30: 225-31. Knorr LC. Denmark HA, Burnett HC. 1968. Occurrence of Brevipalpus mites, leprosis and false leprosis on citrus in Florida. Florida Entomologist 51. Knorr LC, Denmark HA. 1970. Injury to citrus by the mite Brevipalpus phoenicis. Journal of Economic Entomology 63: 1996-1998. Muma MB. 1961. Mites associated with citrus in Florida. University of Florida Agricultural Experiment Station Bulletin 640. 39 pp. Pritchard AE, Baker EW. 1958. The false spider mites (Acarina: Tenuipalpidae). University of California Publications Entomology 14: 175-274. USDA. (2004). Targeting a threat to U.S. citrus mite-borne disease already has foothold in South America. USDA-ARS News & Events. (9 October 2018). Originally published as DPI Entomology Circulars 69 and 154. Updated for this publication. Publication Date: July 2006. Latest revision: October 2018.